This is a warning to all lady drivers in the south. This happened to a female southie just last January 26, 2015. According to the victim, the stop light was not exactly at Daang Hari but was the road leading to Daang Hari. “I don’t know what the street was called but it was the short cut we always take when we come from La Salle,” she said, adding that it was the road connecting Daang Hari to Molino. Regardless of where this happened, this is still alarming. If the police in the area cannot protect us from criminals like those above, we should just be more vigilant of our surroundings so this will not happen to us and our loved ones. Just noticed something: the FRONT tire is being repaired. Was the driver of the car in a coma? As a driver, I would definitely notice if anyone was anywhere near the front of the car. Because, you know, situational awareness. So . . . they approached the car from behind . . . then put on their invisibility cloaks . . . then totally ignored the rear tires . . . so they can mess with the front tires? 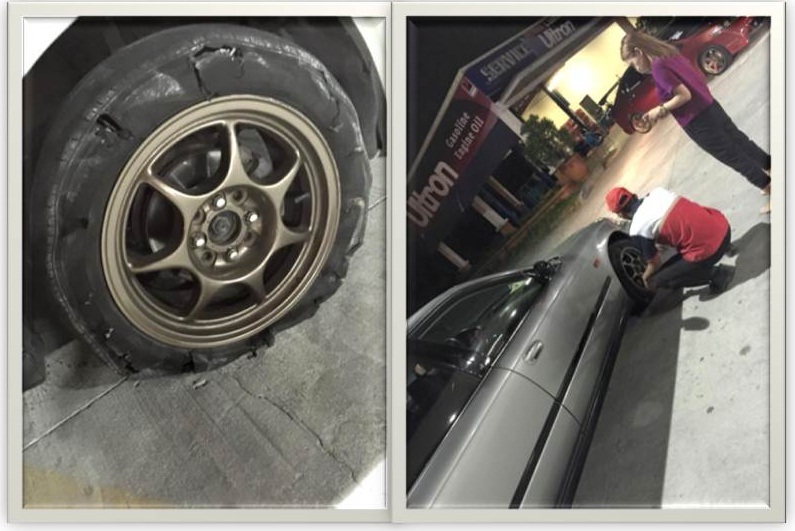 Also, pic of the tire is typical of blowouts from retreads and/or bald tires (just look at the tread on the tire, left pic), NOT what is typical of a car running on slashed tires. If they dumped acid or a similar corrosive fluid on the tires, it would show up splashed on the fenders. Tires are pretty damn resistant to corrosive liquids and anything strong enough to eat through rubber would probably melt the paint off the fenders. Also, any fluid on the tire would not affect the tread (road dirt and dust would pretty much remove it; remember, the car drove off and continued doing so until they got to a service station) supporting the retread/zero tread blowout scenario. The tire tread on the pic above is pretty much non-existent. So unless they misplaced their priorities and got the car washed BEFORE getting the flat fixed . . . um, yeah. If the picture isn’t relevant . . . why was it used with the article? For “flavor” or “interest”? A supposedly serious article with a totally unrelated picture would not only be misleading, but would be outright lying. I’m calling shenanigans and fearmongering on this. Also, misleading title. Dear writer, brush up a little bit more on, you know, logic and the scientific method and writing skills.